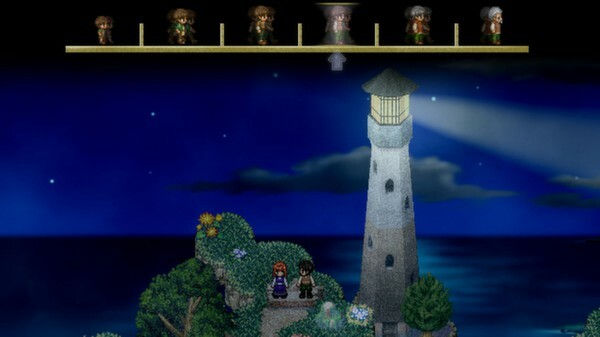 To The Moon is perhaps less a video game and more of visual story. “Playing” this game is akin to watching a movie where we need to tell the characters where to go next. We are less the actors in this play and more audience members calling out suggestions and encouragement. Generally speaking I’m not often a fan of this sort of highly guided story telling where we, as the player, do not get to manipulate the story or have an impact on the characters. To The Moon doesn’t give us moral choices to make and it does not have us greatly impact the lives of the characters; at best we get to set the pace of the scenes. However, To The Moon is an unusually polished gem in the field of interactive story telling and I was very pleasantly surprised at the quality of the story, the pacing and the writing. To The Moon follows two scientists who have an unusual job. They venture into the minds of dying patients and adjust their memories to create a new narrative for the dying person’s life. In essence, the dying person gets to decide how their life should have gone and the main characters tweak the patient’s memories so that they remember their life going the way they wished it had been. The story has hints of the movie Inception in it, where the characters make small tweaks to past memories to cause their client to remember their life in a whole new way. When our story opens the main characters are visiting a dying man who says his dream is to go to the moon. Our heroes slip into the dying man’s memories and start visiting key scenes from the man’s life, trying to find out why he wants to visit the moon and how they can adjust one of his past memories in order to set his dream/memory self down that path. The scientists cannot simply create a new life for the patient to remember from scratch, they need to adjust minor things in past memories to cause the path of the patient’s life to change organically. The game play basically involves us walking around in small scenes from the man’s past and picking up objects which stood out in his memories. Once we find five tokens in the room (or rooms) in a given memory we can travel further back into a previous memory. There is not much for us to do other than walk from room to room and click on objects near the people in the memory. The game takes care of the plot, the actions of most of the characters and occasionally gives us hints as to where we should be looking next. Since this is an interactive story we are not here for the game play and controls (which are minimal and fine for the task) we are here for the story and this is more of a movie review than a game review. As many other reviews have pointed out, To The Moon is often a tragic story. A lot of the memories we visit are either sad or bitter-sweet. To The Moon is primarily a love story and, without giving away too much, the heroes traveling back through past memories realize they are going to need to make some tough choices with regards to their client, the memories of his wife and his memories of his family. The story, while simple on the surface, is very well crafted and gains a certain level of mystery by being told mostly backwards (we begin in the present and work back toward the dying man’s childhood). I feel the pacing is well done, the story often leaves bits of key details unsaid in order to keep us moving forward to discover new clues and I found the game had a surprisingly strong emotional impact. One quality the game has, which I feel might be easily overlooked, is while the story is often sad the individual scenes have a good helping of humour. The two scientists especially have a lot of banter between them that lightens the mood between the heavier scenes in the story. The two main characters are competitive and like playing little jokes on each other which keeps the story from getting too serious. I was also pleasantly surprised when, after sitting through an unskippable credit sequence at the end of the game, there is a bit of twist presented on how the story appears to end. And, I suspect, the developers are setting up a sequel. In fact, there is a follow-up planned with the same characters called Finding Paradise. While there was not much for me to do during the approximately three hours I was playing/watching To The Moon, I think the experience was well worth while. This game is dramatic story telling through interactive media at its finest. I experienced only one small glitch during the game when my character came unglued from its environment and wandered ghost-like around the screen, but a quick re-load fixed the issue. The story definitely had a strong impact on me and I liked the banter and twists introduced. It’s hard to talk about a game like this without giving away key plot details, but I do think it’s a story worth experiencing, for for the humour and for the drama.